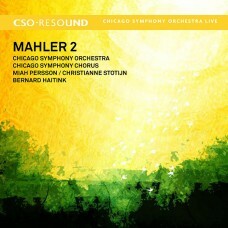 CSO principal conductor Bernard Haitink leads a moving and noble performance of Mahler's immense Second Symphony, continuing his and the orchestra's successful exploration of Mahler's symphonies. The legendary CSO brass are at their finest, with stellar solos and ensemble playing from the woodwinds, strings and percussion. The Chicago Symphony Chorus sounds glorious in Mahler's triumphant finale, singing with a sumptuous sound and immaculate diction. A musical force in Chicago and around the world, the Chicago Symphony Orchestra is consistently hailed as one of the finest international orchestras. Gustav Mahler: Symphony No. 2 in C minor, "Resurrection"